Test your local knowledge with this quiz based on photos taken during 1999. It's pretty easy, but one or two may stump you! Find out instantly whether you're right or not by clicking on what you think is the correct answer. Keep a tally of your score if you're really serious! Otherwise, have a relaxing New Year 99/00. 1) This city centre railway station was rebuilt in 1960. The striking wooden building was recently returned to its original glory, but what's the name of the station? 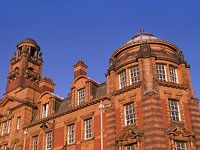 2) For years an old warehouse on London Rd lay empty but eventually it re-opened as which hotel? 3) It's lain empty since 1982 - a magnificent turn-of-the-century palace, but what is it excactly? 4) This glass-fronted building looks modern, but it was built pre-WW2 - which newspaper used to be based here? 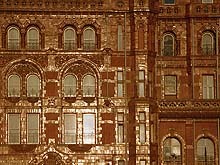 5) In the winter, this hotel facade reflects the sun, but what's the name of the hotel? 6) This is a typical scene of the hilly northern and eastern part of Greater Manchester, with two famous towns to the left and the right. Which towns are we looking at? 7) Another typical scene of beauty from around Greater Manchester, but where is it? 8) This art deco classic on Deansgate faces an uncertain future. Which national newspaper was once produced in this building? 9) This hospital was badly hit in the war but it survived until it was closed the 1990's. Now it's being turned into apartments. Which hospital is this? 10) Though spoilt by post-war blocks, this town has a distinctive skyline - which town is it?